EXL120+, with its 9.5 gauge high E, is the ideal step up string set for players who are moving up from 9 to 10 gauge sets. Additionally, it's great for balancing tension between various scale length guitars. 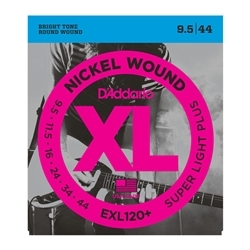 If you play 9s on a 25 1/2" scale guitar, try EXL120+ for your shorter scale length instruments to maintain more consistent feel and playability.